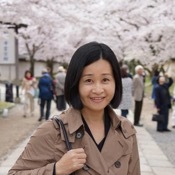 Traveler Ratings for Private Tour in Kyoto, Japan by Tour Guide Katsuko O. TOUR GUIDE RESPONSE: Dear Brent, Thank you very much for your kind review. I'm glad to know that you enjoyed the day. It was really nice meeting you and your wife, and it was a great pleasure to spend time with such a wonderful couple like yourselves. I hope to see you again in the future. Warmest regards, Katsuko O.
Katsuko was a wonderful guide! We saw everything we came to see and she was a wealth of information on the history of the places we visited. We could not have seen so much or learned so much without her tour. She made our visit to Kyoto a great experience. TOUR GUIDE RESPONSE: Dear Kerri, Thank you very much for your kind review. I'm glad to know that you enjoyed the tour. It was really lovely meeting you and I hope to see you again sometime in the future. Please take care and warmest regards. Katsuko O. We enjoyed Katsuko's company and she helped us to enjoy Kyoto's rich culture. Thank you. TOUR GUIDE RESPONSE: Dear Timothy, Thank you very much for taking your time to write a kind review. It was so nice meeting you and your wonderful family. I hope to see you again in the future. Best wishes, Katsuko O. Very nice and polite guide. TOUR GUIDE RESPONSE: Dear Shoshi, Thank you very much for taking your time to write a kind review. It was nice meeting you and I hope to see you again sometime in the future. I wish you prosperity in your business. Best Regards, Katsuko O. TOUR GUIDE RESPONSE: Dear Ellen, Thank you very much for your kind review. It was really nice meeting you and I'm glad to know that you enjoyed the tour. We were so lucky to see autumn color at its peak. I hope to see you again sometime in the future, probably during cherry blossom season next time. Best wishes, Katsuko O. Absolutely a fabulous tour! Katsuko was patient, kind and considerate! Her English is superb! Katsuko is very knowledgeable and easy to talk to ! I would highly recommend her tours!!! TOUR GUIDE RESPONSE: Dear Helaine, Thank you very much for your kind review. It was really lovely meeting you and I had a great time with you and your family. Also, thank you for walking a lot during the tour. I hope to see you again sometime in the future. Best wishes, Katsuko O. It was a pleasure to have met Miss Katsuko in my very rushed and short trip to Kyoto. Her knowledge and insight on airport transfer, public transport, locations of hotel (relative to tourist spots) was unbelievable. Her planning of my half day trip was spot on and even prior to that, the email communication between us was prompt. Great experience! TOUR GUIDE RESPONSE: Dear Hong, Thank you very much for your kind review. It was really nice meeting you. I enjoyed the conversation with you about various topics and especially about Buddhism was lots of learning for me. I hope you'll have a safe trip back home and hope to see you again sometime in the future. Best Wishes, Katsuko O. Very knowledgeable and helpful Excellent guide! TOUR GUIDE RESPONSE: Dear James, Thank you very much for your kind review. It was so nice meeting you and I really enjoyed the two days with you and your wife. I hope to have the chance to meet you again in the future. Best Wishes, Katsuko O.
Punctual and patient, nice and friendly. Thanks for leading us to different places for visit and helping us to communicate with different shop owners. She also introduced much about the history and traditional cultures to us! TOUR GUIDE RESPONSE: Dear Jacqui, Thank you very much for your kind review. It was so nice meeting you and I truly enjoyed the time I spent with you. I hope you were not too tired after a long walk wearing Kimono and wooden clogs. Please take care and I hope to see you again sometime in the future. Warmest regards, Katsuko O. TOUR GUIDE RESPONSE: Dear Kathryn, Thank you very much for your kind review. It was so lovely meeting you, and I'm pleased to know that you enjoyed the day and the lunch at a Zen temple. Hope to see you again sometime in the future. Kochirakoso, doumo arigatou gozaimashita. Warmest regards, Katsuko O.
Katsuko was very knowledgeable about Kyoto, and the areas we visited. Our train stopped midway to our meet-up destination because of the Earthquake, yet we remained in contact, and she waited for us to arrive in Kyoto to start our tour. She made a good suggestion for our lunch, where we were able to get to know each other. She was also able to help us find the only train that was running, so that we could return to Osaka. Thank you for a wonderful tour! TOUR GUIDE RESPONSE: Dear Stefanie, Thank you very much for your kind review. Also thank you for the effort you made to come to Kyoto, in spite of the difficulties due to the earthquake. I'll always remember the day with you and your husband. Warmest Regards, Katsuko O. P.S. I found the macadamia nuts very yummy! TOUR GUIDE RESPONSE: Dear Nina, Thank you very much for your kind review. I also really enjoyed the tour with you. Having a conversation with you about your country, your family, work and so on was really fun. I hope to see you again sometime in the future. Best Regards, Katsuko O. TOUR GUIDE RESPONSE: Dear Andrea, Thank you very much for your kind review. It was really nice meeting you and I am very happy to find you enjoyed the tour. I hope to see you again sometime in the future. Warmest regards, Katsuko.